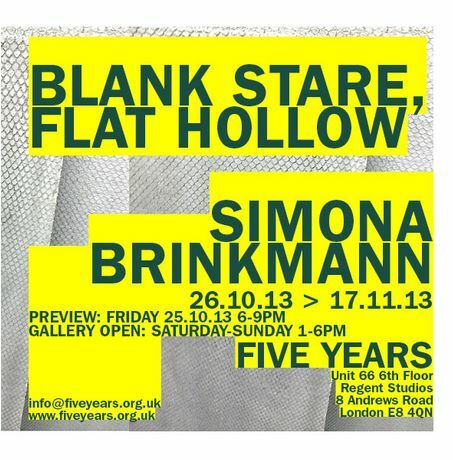 The title of Simona Brinkmann's show at Five Years lists two different ways of describing emptiness. The first is a commonplace expression denoting a vacant, detached state of being. The second is a paradoxical way of describing space. A hollow is ordinarily understood to have a volume. The idea of a 'flat hollow' collapses negative three-dimensional space into two dimensions. This introduces an un-straightforward relation to space. At the threshold of the gallery, an oblong metal frame juts out of the wall horizontally at eye level. Is this an obstruction, a hostile gesture? Or is the frame intended to act as a formal device to organise the viewer's perception? Works in the show employ an ambiguous conflation of different logics: the utilitarian nature of construction materials and functional objects coexists with an an interest in surface, the corporeal is pitted against the built environment, traces of living things are presented alongside un-living things. Concerned with the ways in which power can be articulated and claimed through space, Brinkmann's practice often mines the creative and transformative potential of spatial estrangement, drawing from the conflicts and overlaps between private and public, the fetishisation of space (as well as that of the objects that are used to mediate it) and the idea that space is never neutral or static, but rather a complex process that is constantly 'being made', shaped by a number of factors including a relation to social antagonisms.